Doctors Risk Their Lives To Treat Syrian Protesters Syria began withdrawing army tanks Tuesday from the restive city of Homs, an opposition stronghold. There, doctors often treat injured anti-government protesters in an underground network. 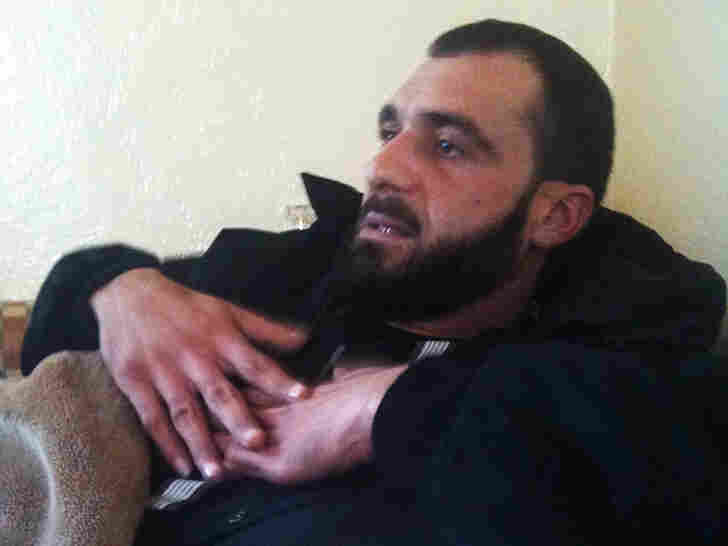 Syrian security forces shot Rabih al-Zain, a 30-year-old Syrian, while he was trying to help wounded civilians in Homs, Syria. Doctors and ordinary Syrians and Lebanese are helping treat the wounded, putting their own safety at risk. The central Syrian city of Homs is an opposition stronghold now under siege by the Syrian army. It's also one place where Syrian doctors risk their lives to treat the wounded. Supplying these secret clinics is also dangerous work, carried out by a network of smugglers in Lebanon who get medical equipment into Syria and transport the most seriously wounded out of the country and into neighboring Lebanon. A sparsely furnished apartment in Tripoli, a city in northern Lebanon, is the first stop on the medical smuggling route. A bedroom serves as a warehouse, stocked on a recent day with stethoscopes, bandages and bottles of plasma. A young Syrian named Mohammed has been running this underground supply line since May. It's a lifeline for Homs, which is just 30 miles away. Surrounded by the army, under heavy shelling, some of the wounded are too afraid to go to the state hospitals inside Syria. "We still need many things that we are not able to secure: X-rays, surgical equipment for bone surgeries, anesthesia," he says. When asked whether these efforts are saving lives, he replies, "It's an attempt to save lives. Some we are able to save, some, we are not." Mohammed makes arrangements by phone with a trusted crew of smugglers. The boxes are broken down into smaller packages for the hazardous journey in trucks, motorcycles, even donkeys, on border crossings that are heavily mined and patrolled. They discuss which roads will be used, where the supplies will be dropped, what's needed. He does this work every day. The traffic goes both ways. The makeshift clinics inside Syria can only do so much — stop the bleeding and some of the pain. The most seriously wounded, who often have multiple gunshot wounds, are smuggled out of Syria and into Lebanon. At an underground clinic on the border between Lebanon and Syria, a doctor — who does not want his name used for security reasons — says his wife doesn't even know about the work he is doing. But when there are wounded on the Syrian side, he gets the first call. The Lebanese doctor says it's his duty to help. "I go to the border, I meet with the wounded person, I conduct basic first aid," he says. Treatment often takes place in the back of his car, until he can drive to his clinic for more intensive care. In one Lebanese farming village, families open their homes to Syrians who need long-term recovery. A spare room serves as a hospital room for 30-year-old Rabih al-Zain. He's been here for 20 days. His shattered leg is wrapped in bandages. Syrian security officers opened fire on demonstrators in his village near Homs, he says. When Zain tried to help the wounded, he was shot repeatedly in the leg. In a nearby farm home, a 19-year-old Syrian army deserter props himself up on a pillow when visitors arrive. He stepped on a mine on the border a few weeks ago and lost his leg below the knee. "I never got the chance to fight, I didn't have any weapons," he says. The state hospital in his Syrian village has been turned into a military barracks, he says, adding "they would have killed me if I'd gone there for help." His mother weeps when she hears him talk about the explosion that severed his leg. She crossed the border as soon as she knew he was in Lebanon. "I am afraid," she says softly. "I have nine children. We are under a lot of pressure. I still have family inside."